'Border Bandit' ( Paul Black, R. 1989). Seedling 8343A. BB, height 27" (70 cm), Early bloom season. Standards golden tan with orchid flush up midrib; golden tan styles tipped orchid; falls bright orchid fuchsia with 1/8"plum brown rim; bright yellow beard. 'Gala Madrid' X seedling #B81-93, 'Brassy Broad' sibling. 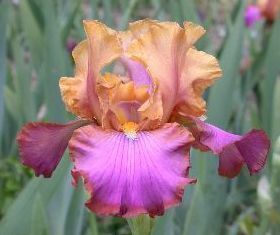 Mid-America Iris 1989. Honorable Mention 1991, Award of Merit 1993. From Mid-America Garden catalog, 1989: BORDER BANDIT - BB, 28" (71cm), Early. Masked behind golden-tan standards with an orchid flush up the midrib is the orchid reverse side of the standards. Rounded and perky falls are bright orchid-fuschia with a l/8" plum brown band. Bright yellow beards make this Bandit irresistable. Pretty, tightly formed flowers on well branched stalks. Sdlg. 8343A: Gala Madrid X B81 - 93: ((Bayberry Candle X Bamboo Curtain) X Copper Capers) X Chartreuse Ruffles. SEE PHOTO. See Special Offers for FREE plant. JPG borderbandit02.JPG manage 86 K 07 Jun 2014 - 20:12 Main.TLaurin Photo by Don McQueen,London, Ont. Canada Zone5. JPG borderbandit03.JPG manage 79 K 07 Jun 2014 - 20:13 Main.TLaurin Photo by Don McQueen,London, Ont. Canada Zone5. JPG borderbandit04.JPG manage 69 K 07 Jun 2014 - 20:15 Main.TLaurin Photo by Don McQueen,London, Ont. Canada Zone5. JPG borderbandit06.JPG manage 102 K 19 Jul 2014 - 20:24 Main.TLaurin Photo by Don McQueen,London, Ont. Canada Zone5. JPG borderbandit07.JPG manage 55 K 28 Nov 2014 - 03:54 Main.TLaurin Photo by Don McQueen,London, Ont. Canada Zone5. JPG borderbandit08.JPG manage 52 K 28 Nov 2014 - 03:55 Main.TLaurin Photo by Don McQueen,London, Ont. Canada Zone5. JPG borderbandit09.JPG manage 51 K 28 Nov 2014 - 03:58 Main.TLaurin Photo by Don McQueen,London, Ont. Canada Zone5. JPG borderbandit1.JPG manage 60 K 19 Jul 2015 - 03:02 Main.TLaurin Photo by Don McQueen,London, Ont. Canada Zone5. JPG borderbandit3.JPG manage 795 K 03 Jul 2016 - 21:13 Main.TLaurin Photo by Don McQueen,London, Ont. Canada Zone5.